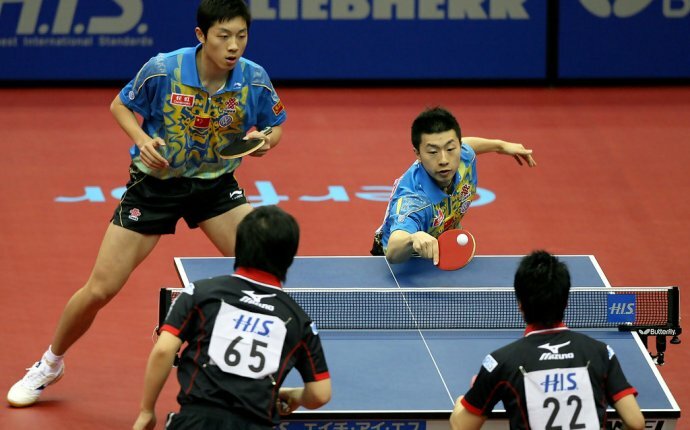 China has won gold in all but one Olympic doubles table tennis event. Doubles table tennis has been featured in the Summer Olympics Games since its introduction in the 1988 Seoul games. Doubles presents a more complex strategic challenge than singles table tennis, because teammates must take turns hitting the ball. Efficiently shuffling on and off the table between hits is a key to cutting down your opponents' opportunities for an angled winner and mastering the flow of doubles play. 1. Flip a coin to determine which team serves first. 2. Serve the ball from the right side of the near court to the left side of the far court. On serve, the ball must bounce once on your side of the net before landing on the opponent's side. 3. Step off to the right of the table after hitting the serve. Your partner steps to the center of the table in preparation for the next shot. 4. Watch your partner hit the ball, then slide left, back to the center of the table, as your partner slides left away from the table. 5. Alternate hitting shots with your partner until the point is over. If any player hits a shot out of turn the point goes to the opposing team. 6. Serve a second point to the same opponent. 7. Swap sides of the table with your teammate after your second service point concludes. Your teammate now receives two serves from the player that you just served to, after which your teammate serves two points. 8. Switch sides with your teammate at the conclusion of his second service point. You receive the next two points, then serve the following two points. 9. Continue play until one team wins the game by reaching 11 points. If the score reaches 10-10, continue until one team has two points more than the other. In wheelchair doubles table tennis, teammates do not need to alternate hitting the ball but must remain on their own side of the table throughout the point.